General Landscape Uses: An excellent accent or specimen tree in moist to dry soils. It can be used as a street tree and in commercial and residential landscapes. A good shade tree in the hot summer months. 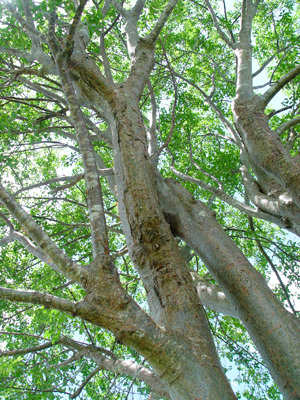 Ecological Restoration Notes: One of the most common and important canopy trees in tropical hammocks. Description: Medium to large tree with a rounded and usually broad spreading crown, moderately dense to open. Trunk thick, sometimes short, 1-3 feet in diameter. 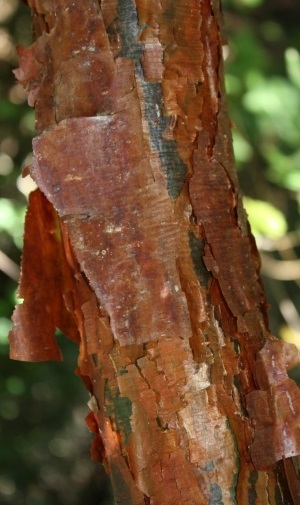 Bark thick and resinous; almost always with a thin, red peeling outer layer which varies in color from tree to tree. Leaves compound, 6-8 inches long; leaflets thin, smooth, becoming mottled with age. Semi-deciduous, losing its leaves immediately before leaf turnover and during extended periods of drought. Dimensions: Typically 30-50 feet in height; to 64 feet in South Florida. Can be as broad as tall or broader. Range: Monroe County Keys north, mostly along the coast, to Brevard, Glades, Pinellas and Hillsborough counties, with more recent records to the north of this area; West Indies, Mexico, Central America and northern South America. It is more common on the east coast of peninsular Florida to about Cape Canaveral, but less so in the interior and on the west coast. For a digitized image of Elbert Little's Florida range map, visit the Exploring Florida website. Flower Characteristics: Inconspicuous. Unisexual or perfect, with flowers of both sexes on the same tree. Flowering Season: All year; peak winter-spring. Fruit: Greenish-brown to red-purple fleshy capsule, separating into three sections at maturity, exposing one or two reddish seeds. Wildlife and Ecology: Provides moderate amounts of food and cover for wildlife. Larval host plant for dingy purplewing (Eunica monima) butterflies. Kingbirds and other flycatchers eat the fruits. 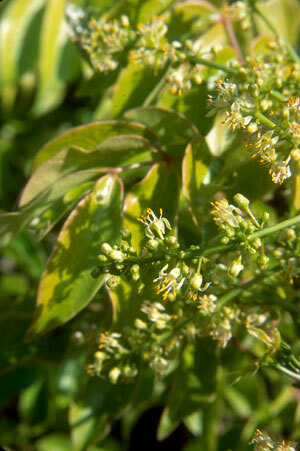 Horticultural Notes: Can be grown from seeds or cuttings, even large limbs. Seeds germinate within a month. Some say that plants grown from cuttings are not as strong as those raised from seed. 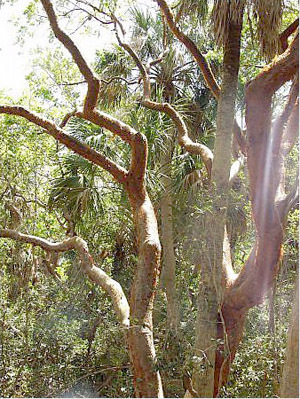 Comments: Gumbo-limbo is one of our fastest growing and most versitile native trees. 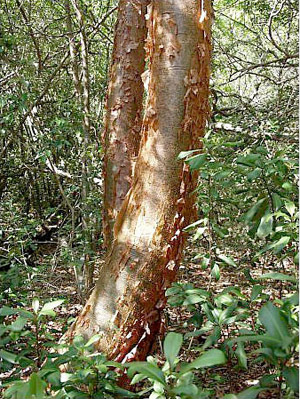 It has attractive reddish flaking bark, thus one of its common names "tourist tree." In high winds, such as from hurricanes, the trunks usually will not blow over, but the tree will lose some of its limbs and will refoliate quickly. Calusa Indians and others used the sticky bark resin to trap songbirds for food or trade.